You don’t have to be on retreat to stay at St. Katharine’s. If you are looking for something a little different - then we are just the place for you! A house with an interesting history, where some of your favourite TV series have been filmed (we have appeared in Midsomer Murders, New Tricks, Lewis and Endeavour among others). ​We have limited availability at weekends but it is always worth checking. Our rooms are spacious and comfortable and all double and twin rooms in the main house have en-suite shower rooms. The two single rooms have en-suite toilet and hand basin. Towels and hand soap are provided and there are tea and coffee making facilities in all rooms. However you have to appreciate that we are primarily a retreat house, not a hotel, so there are no TVs or telephones in the bedrooms; and although most staff live in the building, you may not always be able to find someone ‘on duty’. There is free wi-fi throughout the house, but mobile phone coverage is patchy. ​So why come to St. Katharine’s? Well, apart from our low prices, you will be able to soak up the ambience of a Victorian country house, sit in what was King Zog of Albania’s private study, choose a book to read from the library, or simply gaze out of the windows at our beautiful grounds. ​There is plenty to see and do in the Chilterns and the area is a draw for walkers and cyclists. Indeed, St Katharine’s is on the Chiltern cycle route. You can start the day with a generous Continental breakfast and if you want lunch or dinner we can usually provide them too. We do not have a drinks licence but you are welcome to bring your own alcoholic drinks. If you would rather dine out, there are excellent pubs and restaurants in the vicinity but note, there are no footpaths or street lights. We have 10 acres of grounds which visitors are free to enjoy. Although much of the area is laid to grass there are interesting features to discover. 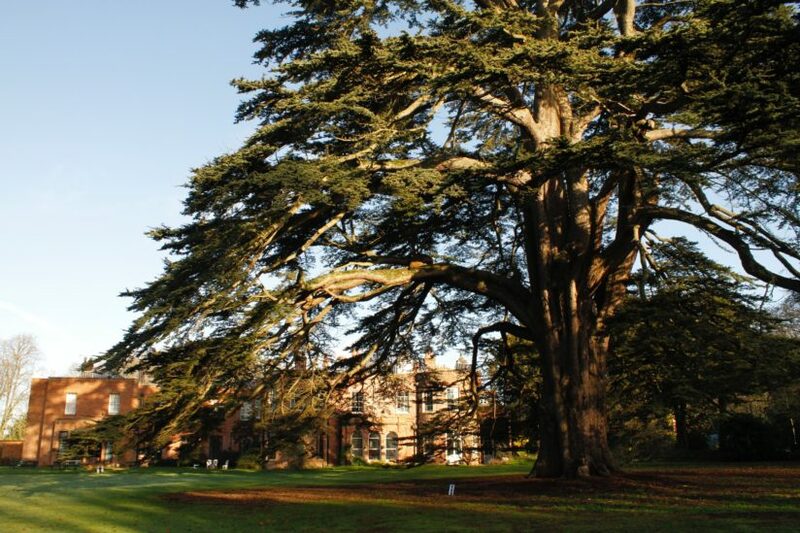 The most obvious is our magnificent cedar of Lebanon. Its exact age is unknown, but it is certainly one of the oldest and largest in the country.